Home › Health Insurance › It’s All Good News with Obamacare – Or Is It??? There’s nothing to fear folks because our healthcare crisis has been solved. It’s all good news with Obamacare. That’s the word from the US Census Bureau. According to their data, the number of uninsured in America has been falling steadily for at least the past three years. Is that what’s really happening or should we all have serious doubts? The improvement in the statistics on the uninsured is just that – statistics. As Mark Twain once remarked, There are three kinds of lies – lies, damned lies – and statistics. That last form of lying is what makes me suspicious because statistics can always be gamed. The pattern in recent years is that nearly every statistics report has an optimistic spin to it. I hope you’ve noticed that too. Analysts will sift through negative reports and look for nuggets of positive trends that will confirm the official national narrative that all is well. So it is with Obamacare and the state of American healthcare. We don’t need to do anything because everything is just great. According to the highlights of the Census Bureau report, Health Insurance Coverage in the United States: 2016, the number of uninsured Americans has hit a new low. The number without health insurance fell to 28.1 million in 2016, or 8.8% of the population. That’s down from 29 million in 2015, or 9.1% of the population. That means that there were 900,000 fewer uninsured Americans, in a country of 325 million people. Hooray – the crisis is being solved! Is it being solved specifically by Obamacare, officially known as the Affordable Care Act (ACA)? It turns out that it’s not the ACA that’s lowering the number of uninsured people in America. That’s because another Census Bureau revelation is that the percentage of people on Medicare increased by 0.4% between 2015 and 2016. The percentage of uninsured fell by 0.3%. If we subtract out the number of people who went on Medicare the equation changes. It reveals that the actual number of people covered specifically by ACA fell by 0.1%. The optimists will take that point and spin it as proof that Americans are 0.1% less dependent on ACA than they were a year earlier. You’ll try anything when you’re looking to put happy spin on every statistical revelation. I find myself in full agreement with IBD’s analysis. Obamacare is driving accelerated increases in healthcare premiums. While supporters of Obamacare celebrate the apparent success of the program, there are at least two factors that are primarily responsible for the decrease in the number of uninsured. Growth in Medicare. According to the Kaiser Foundation, there were approximately 50 million people on Medicaid in 2010 when the ACA was being rolled out. There are now 74.3 million people on Medicaid as of June 2017. The number of people uninsured has dropped from 50 million in 2010 to about 28 million in 2017. That’s a drop of 22 million people. But during the same space of time the number of people on Medicaid has increased by more than 24 million. That means that if you remove Medicaid from the equation, Obamacare has actually resulted in a net increase of at least 2 million uninsured Americans. Improvement in employment. According to the Bureau of Labor Statistics (BLS), there were 130.5 million Americans employed in June 2010. The number has climbed to 146.4 million by June 2017. The number of employed people has increased by 16 million in the past seven years. It’s a good bet that several million of those newly employed also got employer-sponsored health insurance. That means that they didn’t get Obamacare coverage. Notice how the officialdom hyper-focuses on one statistic: the decline in the number of uninsured. At the same time it completely ignores the elephant in the room. That’s the rapidly increasing cost of health insurance and health care. This is where the “affordable” aspect of the Affordable Care Act has been carefully shrouded. Sure, more people are getting insured through both Medicare and Medicaid or through employer-sponsored plans. What that means is that they’re largely shielded from the real cost of healthcare. The situation is getting progressively worse for anyone not covered by an employer plan, Medicare or Medicaid. The health insurance premium for my family was over $21,000 in 2016. We’re currently on a COBRA from that plan that’s now costing us $1,875 per month. Is that remotely affordable? It isn’t and that’s the Achilles’ heel of the ACA and that’s why it can’t have a happy ending. All of this bad-news-is-really-good-news-but-no-it-REALLY-is-bad-news stuff is happening during what we’re being told is a healthy economy. I think most of us know that it’s a farce. The economy may be better than it was back in 2008 – 2012 but it isn’t strong either. Many of us sense that something’s wrong. What happens when the country goes into the next officially declared recession (if the officialdom will ever admit to such an event)? We can fully expect that even the government’s own happy numbers will go sour. Millions will become unemployed and lose their health insurance. Millions more will lose their health insurance because either their jobs or their benefit packages will be downgraded in response to the economy. My guess is it will go from the stated 28 million currently uninsured back up to some number well over 50 million. I believe it will happen in short order. If the Investor’s Business Daily analysis is accurate it’s already happening. Once the economy starts to become seriously unglued the number of uninsured will surge. The troubles in healthcare and health insurance are being partially masked by happy statistics. But the next recession is likely to occur before the 2020 presidential election. By the time election season comes around it’s very likely that healthcare will be the dominant issue once again. It’s also likely that the next president will ride into power with a mandate from the American people to finally fix this mess. That won’t necessarily be a blessed day. The current cost levels in healthcare are already completely unaffordable. Any options will be bad. I believe we’re finally going to be forced to make a choice between the current regime of high service/high cost and a reduced service/more affordable option. The public won’t like either. But when forced to make a choice, I believe it will be reduced service/more affordable. We’re already in the high service/high cost conundrum and it’s not working at all. By the time the next downturn hits America may finally get over its fascination with fantasy solutions. At least I hope we will. We certainly can’t keep continuing the way we have. If I’m right about 2020 the actual replacement system will take years to implement. No legislation will even be advanced until 2021. If we’re lucky, a true reform package will be approved by the end of that year. Even if it is it will probably be phased in over several years. It won’t be in place fully before 2025. That means we have at least eight years in the current system. Or whatever will become of it during that time. If you or your spouse have a job with health insurance, stay on that job as long as possible. If you can’t keep your job, try to get a part-time job with health insurance. There really are such jobs. My family actually benefited from one for a number of years. Create a dedicated income for health insurance. It could be a part-time job or a side business. I make my full-time living as a freelance blog writer, but something similar can certainly work as a side business to pay your health insurance premiums. Investigate the least expensive policy you can get on the healthcare exchanges. That will mean the highest deductible. You can partially offset the high deductible by setting up a Health Savings Account (HSA). I’ve recently done that since I don’t see this situation getting better anytime soon. I realize these are not perfect solutions. But the healthcare problem is getting a little bit worse each year. All we can do is the best we can do. 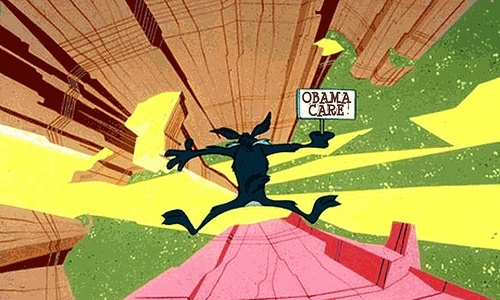 16 Responses to It’s All Good News with Obamacare – Or Is It??? Believe me they noticed the rise in Medicare enrollment because it effects the funds for all that free healthcare ( Medicaid)). That’s why they are talking about giving seniors “vouchers “ for healthcare because they need those funds. The size of the Baby Boomers group demands the funds not be touched. It irritates me to no end when the two completely separate programs are lumped together when they aren’t. To start even more limited service coverage to seniors who don’t have the option to get a job let alone work is wrong especially when able bodied individuals are getting taxpayer paid benefits plus free healthcare. I am for this new incentive for private healthcare programs by which you are not having to pay for a coverage mandate you don’t need ( for argument sake, I will use mental healthcare). Majority of healthy people have no need for this but maybe the millennial generation does. Basically what I am trying to say is that a healthcare insurance program should be tailored to each person’s needs and billed accordingly. Under Obamacare, you pay for a whole package regardless if you use any if all of coverage. Sort of like having full coverage on an old car. You mentioned in several articles about various private insurance groups which were set up as non-profit where everyone participates with a much lower premium contribution. Maybe we will see more programs like that. I am just afraid that in my area (NewYork) it may be harder to do, as I know of one very successful group that had to close down because of adherence to mandated requirements. Hi Maria – I think what the politicians are having trouble with is admitting to the citizens that they’re over-extended on both Medicare and Medicaid. That means more cuts to both, though probably done with great stealth so as not to raise concern. These people have become very adept at hiding what they’re doing, which is part of the reason we’re slowly suffocating as a society (the “frog in the pot of boiling water’ syndrome). Please don’t get me started on able bodied people on disability/medicaid. One thing I can’t stand about where I’m living (one of the few actually) are the armies of young, able bodied people who are on disability, medicaid, Sec 8, SNAP, etc. Most of these chiselers need boot camp, not public assistance. But I have to keep reminding myself that it’s yet another political ploy (put as many people on the dole as possible to keep them quiet). Those organizations that provide lower cost coverage are the Christian health sharing ministries. They aren’t really health insurance because there are limits on coverage. But I’ve never heard of anyone not getting full coverage. The main problems though is that you do have to medically qualify. For example, if you had heart attack two years ago they can decline you for coverage. Not very Christian if you ask me. But they will also exclude you if you engage in immoral activities, like smoking, drinking and drug use. I’m not sure about these. They’re certainly not the answer for everyone. Geez it appears that affordable healthcare falls in our hands after all. It all comes down to being an informed Consumer which I find is not how people tend to think, nowadays. You and I tend to want knowledge to make informed decisions based on real facts. Problem today getting real facts like actual cost of medical services is ridiculously hard because costs is not a mandated requirement for control of costs to consumers. Similar/same services are determined by profit achieved in the geographic location, which is totally wrong. I live in what is considered standard high cost area because of higher amount of those getting services at low or no cost. This is one of the reasons, I can’t afford top of the line healthcare plans or anything else when my paycheck/ income is above the cutoff considered eligible for aid benefits. Especially when rents/ housing are 40-50% of income. Yes there are areas with lower costs of living but you have to give up availability of public transportation to go more suburban and access to convenience of stores, etc. I understand that, by executive order, those subsidies which made healthcare “affordable “ will not be funded for the next cycle of Obamacare starting January 2018. Now more people ( those who actually pay) will be faced with those full premium costs which I hear the insurance companies have been allowed to raise again. Our lawmakers are extremely reluctant to make any changes because of that special healthcare plan and drug coverage they have (taxpayer paid) under Obamacare. Why would they want to give up a good thing? Plus both the healthcare insurers and the drug companies pay them funds to keep status quo. Yes keeping those who they “gave “ free healthcare using the Medicaid program keeps them covered using funds paid for another source Medicare. Because of that, both completely different programs are going to be affected. Which is why I feel our lawmakers need their special coverage effected also to feel the pain. ( share the reality horror). Knowledge is power but most people believe the dirrble being sent out via fake news sites because it makes them feel good. Just because a site makes a statement doesn’t make it a true fact. If I believe that my healthcare insurance would only be $20 a month but in reality it’s way more. You make some good points for getting some relief from healthcare costs—a covered employment plan or co-op program. Again, these plans are not the norm, especially with more emphasis being put by the younger generation for unlimited Paid leave, because they are still in that state of mind that they are going to be healthier with more time off work and don’t worry about future needs. Perhaps as they get into real adult life with all the necessary obstacles one deals with, they’ll see what we’re talking about. In the meantime, we have to figure out how to make healthcare affordable for our needs. What it all means is that we’re stuck with a very flawed system, with no easy solutions. That’s the point I’ve been trying to make for years. We’re just muddling through, and it will be no better than that. I fully expect that by the time my wife and I are on Medicare the system will be so gutted that we’ll mostly be relying on the supplemental coverage. And by then, the supplemental coverage will approach what regular private insurance costs now. My bigger picture guess is that if this doesn’t get fixed with the 2020 election, tens of millions will drop health insurance for cost reasons. At that point, employers will be doing the same, since it will cost close to a year’s salary to pay the premiums. That’s when the whole situation will be forced to rewind with a whole new system. Which we can also suppose will be less generous than the current one. I think we’ve reached the point of “peak healthcare”, and that’s the fundamental problem. That can only be cured by a price/service collapse. The current madness of trying to make an inherently unaffordable system affordable is a complete waste of time. It can’t be done when costs are already unsustainable. Very true and it doesn’t help having all the whiners who mooch off the system making all the rhetoric comments. The millennial generation claims they have creative way to solve this, so lets hand it to them to solve, especially now that they are entering the political field. All I ask is not to hurt economically those who don’t have options. I feel bad for the Millennials on this one. They’re inheriting a healthcare system that’s in its terminal phases. Many of them will get no benefit from the current system, but they will bear the cost of replacing it. We can only speculate on what that will look like. The only sympathy I have for this group is for those who haven’t been handed everything and who don’t expect everyone else to carry their load. These bright minds aren’t wasting their lives but have found ways to effectively deal with life. The big difference between us and them is the understanding of how to utilize technology. I really appreciate your articles! I have employer based healthcare, which basically means you still pay all of your healthcare out of pocket, plus you have the privilege of paying for the policy to then pay for all of your healthcare. Millions of people are in this same boat, yet we are counted as being insured. I can’t even get basic doctor visits now, because if you can’t pay right away, they all threaten to send you to collections, and they are now balking at payment plans. No one seems to be addressing the issues of increased regulations, or the cost of health services. I was billed $700 a year ago for a chest x-ray that I had to pay out of pocket! I hope you continue to bring attention to these important issues! Thanks Linda. Yeah, I think I’ll keep writing about this topic because it’s so important, and yet so intractable at the same time. Your situation is typical (most unfortunately). Under employer sponsored plans, you’re socked for employee portion premium payments, and because of high deductibles, it’s effectively no better than a catastrophic plan. I mean, a $5,000 deductible ($6,500 out of pocket max) means you’re paying for everything but the big stuff. If that’s the case, then the premiums are way too high. Pre-Obamacare you could get true catastrophic coverage for very low premiums, even on an individual plan. But that’s all gone now. What you’re describing is exactly why I think this thing will blow up. Every opportunity to create an intelligent system is being ignored in favor of maintaining the status quo system. It won’t be fixed until it collapses. But we’ll all be hurt when it does, and that’s the part I don’t like. I’d love to be optimistic about this, but the facts don’t support optimism. Hi Linda – You’ll have to forgive your kids for thinking that way. The education system taught them to think that way. Within the scope of modern academia, whatever the problem, the government is the answer. If you believe otherwise, and don’t agree taxes should be raised to pay for it all, then you just want to “starve children, throw grandma out in the street, and destroy Mother Earth” (even if none of those has anything remotely to do with the subject at hand). There is no easy answer to healthcare, certainly not universal coverage. It won’t work in America because we’re already too far down the path of peak healthcare. Kevin—excuse me but I had to respond to Linda whose millennial son and wife are the tail end of that group. Don’t worry about them not understanding what you are saying about not wanting to pay a high tax to insure someone other than you gets “free “ healthcare, etc. What you need to do is refer them to the present day state of affairs in the country of Venezuela who tried the socialism route ( free government controlled everything) and the money ran out because those who were paying left, leaving the poorer people to fend for scraps. My son and daughter are in the older part of the millennial generation and they always complained about wages and opportunities until they realized that the country (government) doesn’t make them wealthy but they have to create their opportunities to make money. Sharing their hard earned money with the government in excessive taxes to give handouts to non-paying non working individuals is not an option. Expecting a free for all healthcare coverage is never going to happen but by working together we can create a les costly coverage by eliminating excessive unpredictable costs by demanding transparency upfront in costs. Tell them that and tell them the story about bringing a horse to the water but he has to drink himself. Well put Maria Rose, the only thing I have to add it Amen! Venezuela is an excellent metaphor for where America is heading if we don’t snap out of this fantasy world we’re pretending to live in. Reality may take longer than we expect to reassert itself, but it always does. Thank you for your responses. I did try the Venezuela angle on them, only to be told that socialized medicine works wonderfully in other countries and that is just a bad example. I told them that if our government can’t even handle the VA, how in the world will they (gracefully) handle the entire country’s healthcare?!! I can’t win this argument as they always have a comeback, but I do understand their desire to fix this healthcare system, I just don’t agree that handing it over to our government is the right thing to do. Yeah, if you think about it, they’re the ones (the government) who largely made health insurance more expensive with Obamacare, and they’ve been putting the squeeze on Medicare, which is already in deficit. Imagine what damage they could do with a universal system. Universal works in Europe and Canada because they implemented it before it got out of control, cost wise. For it to work here, there’d have to be a 50% roll-back on the cost of the system first. We can’t raise taxes by more than $3 trillion to support a universal system (which would about double current tax levels) without crushing the economy. No one in America talks about cost containment, all they focus on is “making it affordable”, which is code for having someone else pay for it. You can’t fix a complex problem when your starting point is Fantasyland. Oh my goodness it is so nice to talk to other like minded adults for a change! Than you for your input and, as always, I agree with your responses. Let’s just pray that someone can turn things around for this country before it implodes!